One of the most important, interesting and challenging questions in biology is how new traits evolve at the molecular level. My lab employs sequence analysis techniques to interrogate protein and DNA sequences for the signals left behind by evolution. We are a bioinformatics lab but like to incorporate bench data through collaboration wherever possible. Many protein-protein interactions are mediated by Short Linear Motifs (SLiMs): short stretches of proteins (5-15 amino acids long), of which only a few positions are critical to function. These motifs are vital for biological processes of fundamental importance, acting as ligands for molecular signalling, post-translational modifications and subcellular targeting. SLiMs have extremely compact protein interaction interfaces, generally encoded by less than 4 major affinity-/specificity-determining residues. Their small size enables high functional density and evolutionary plasticity, making them frequent products of convergent "ex nihilo" evolution. It also makes them challenging to identify, both experimentally and computationally. A major focus of the lab is the computational prediction of SLiMs from protein sequences. This research originated with Rich’s postdoctoral research, during which he developed a sequence analysis methods for the rational design of biologically active short peptides. He subsequently developed SLiMDisc, one of the first algorithms for successfully predicting novel SLiMs from sequence data - and coined the term “SLiM” into the bargain. This subsequently lead to the development of SLiMFinder, the first SLiM prediction algorithm able to estimate the statistical significance of motif predictions. SLiMFinder greatly increased the reliability of predictions. SLiMFinder has since spawned a number of motif discovery tools and webservers and is still arguably the most successful SLiM prediction tool on benchmarking data. 2. The evolution of novel functions. Previous work in the lab has focused on the evolution of functional specificity following gene duplication. Since moving to UNSW, activities have shifted more towards the use of PacBio long read sequencing and other cutting-edge sequencing technologies, working closely with the Ramaciotti Centre for Genomics. We are collaborating with industrial and academic partners to de novo sequence, assemble, annotate and interrogate the genomes of a selection of microbes with interesting metabolic abilities. Most notably, we have an ARC Linkage Grant with Microbiogen Pty Ltd. to understand how a strain of Saccharomyces cerevisiae has evolved to efficiently use xylose as a sole carbon source: something vital for second generation biofuel production that wild yeast cannot do. We are combining comparative genomics, evolutionary genetics, RNA-Seq transcriptomics, and competition assays to understand how the novel metabolism evolved. Through deep Illumina resequencing of evolving populations, and assembling reliable complete genomes of the founding ancestors, the ultimate goal is to trace how mutations have interacted with existing genetic variation during adaptive evolution. 3. Whole genome sequencing and assembly. Following our experiences with de novo whole genome assembly in yeast, the lab is getting involved in an increasing number of genome sequencing projects. The biggest of these is leading the bioinformatics and assembly effort in a consortium to sequence the cane toad genome. The lab is also leading the BABS Genome project two iconic Australian snakes for use in teaching and public engagement. We are a member of the Oz Mammals Genomics initiative, assisting with the sequencing and assembly of Australia's unique marsupial fauna. We also have an number of bacterial long-read whole genome sequencing collaborations. 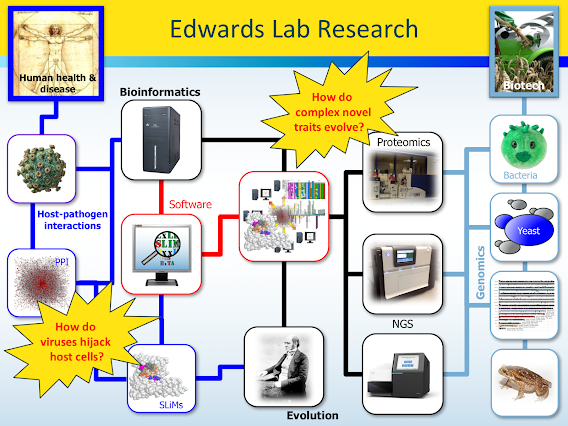 In addition to the main research in the lab, the lab has a number of interdisciplinary collaborative projects applying bioinformatics tools and molecular evolution theory to experimental biology, often using large genomic, transcriptomic and/or proteomic datasets. These projects often involve the development of bespoke bioinformatics pipelines and a number of open source bioinformatics tools have been generated as a result. We frequently have small collaborations and/or undergraduate student research projects. Many of these are “on hold” waiting for the right person, or sometimes data, to come along. If you think that you have what it needs, get in touch! The lab has been involved in a number of interdisciplinary collaborative projects applying bioinformatics tools and molecular evolution theory to experimental biology, often using large genomic, transcriptomic and/or proteomic datasets. These projects often involved the development of bespoke bioinformatics pipelines and a number of open source bioinformatics tools have been generated as a result. Please see the Publications and Lab software pages for more detail, or get in touch if something catches your eye and you want to find out more.